1. The bilge needs to be as close to completely dry as you can get it. You don't want water freezing and thawing in the very bottom of the hull of the boat. 2. You need to have good airflow. 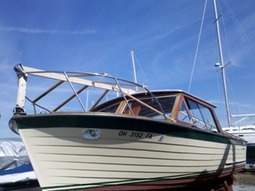 A wooden boat needs to be able to fully dry out to prevent rot. 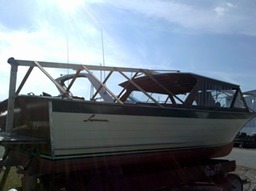 Pull the deck plates that run over the bilge, leave the cabin hatch up a bit and leave the cabin doors open. This way, if moisture does form on the inside of the boat, air can get in and help evaporate it. Allowing airflow will also prevent mold and mildew from forming. To accommodate the two points above, we first used a wet/dry vacuum and a roll of paper towels to get as much standing water out of the bilge as we could. Then we built a wooden frame which consists of a few 2x4s lashed together, with some 1x2s used to hold up the tarp and prevent it from sagging under the weight of snow. 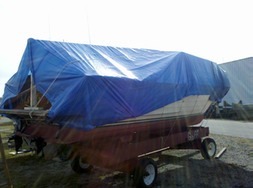 Next we covered the boat with a tarp letting it hang over the bow and stern, but not completely shutting it as to provide airflow to the boat underneath from the stern or bow.